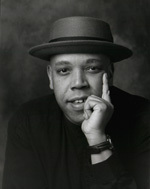 Robert Alexander is the author of 29 plays, including SERVANT OF THE PEOPLE, I AIN’T YO’ UNCLE, A PREFACE TO THE ALIEN GARDEN, and THE LAST ORBIT OF BILLY MARS. His plays have been produced by Trinity Rep, Woolly Mammoth Theatre Company, the Mark Taper Forum, the Lorraine Hansberry Theatre, Hartford Stage, San Diego Repertory Company, the San Francisco Mime Troupe, and Actors Theatre of Louisville. Mr. Alexander has received grants from the Pew Charitable Trusts and the National Endowment for the Arts. He has a B.A. from Oberlin College, and an M.F.A. from the University of Iowa where he was a Patricia Roberts Harris Fellow.